Welcome to your cottage "L'Oubesou"! it is an ideal home for large families, in a small quiet hamlet in southern Ardèche, 100m from the river Chassezac. On the ground floor, you have a beautiful vaulted room of 50 m², cool in summer where you can play football or relax, a room with a bed 160, a bathroom, a toilet and laundry. On the 1st level, you have the living room / kitchen with a wood stove, a room with a bed 160, a room with 2 beds a place, a room of water, a toilet. a relaxing lounge with TV, DVD + hifi, a beautiful covered terrace overlooking the courtyard for your meals. On the 2nd level, you have an attic room with a bed 140, a small room with 2 bunk beds (low 140 and high 90), a bathroom with toilet. Electric heating, cot, bath and high chair available .. In the enclosed courtyard, trees and flowers, you have a shelter for 2 cars. This region is a permanent invitation to discover an exceptional heritage (the dolmens, the Païolive wood and its ruiniformes rocks, the gorges of the Ardèche and the Cave of the Pont d'Arc ...). You will be amazed by the beauty of the villages of Balazuc, Labeaume, Banne, Naves ... To find the freshness, take the height by going to Gerbier des rushes, the waterfall of Ray Pic, or in the caves of the Aven d'Orgnac, Marzal, La Cocalière ... It is also an excellent playground for outdoor activities. You will taste the joys of bathing in the gorges of Chassezac. Climbing enthusiasts will be delighted by the variety of routes offered on the nearby and famous sites of Cholet and Mazet ... Hikers, bikers, cyclists and / or mountain bikers will find their happiness on the many circuits starting from the house located on the course of the GR4. Beautiful holidays in anticipation! Other rentals available 10/13 people: Contact us. court side, A wooded area and flowered of 200 m2, a private carport for 2 cars, a barbecue area, garden chairs. Nous avons trouvé tout le confort nécessaire. La maison est située dans un espace calme, à deux pas de la rivière, la cour fermée est un plus pour les jeunes enfants et les animaux, la terrasse agréable par beau temps. Nous avons beaucoup apprécié le baby foot et la table de ping pong !! de grands tournois ont été engagés. La famille Deleuze est très sympathique et accueillante. 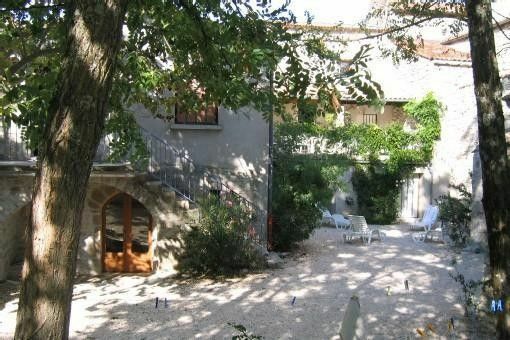 In a quiet hamlet of Lower Ardèche, equidistant (8 kilometers) from the village of Vans, Joyeuse and Ruoms, 35 kilometers of Aubenas, Maryse and Bernard Deleuze will welcome you to their restored house of Oubesou (pronounced Laoubesou) with a capacity of 10 people, along the river Chassezac. A soon to be delicious holiday in Lower Ardèche. Nuitée prix forfaitaire (voir modalités avec le propriétaire). Chauffage non compris dans charges.